Overall standards in course maintenance and presentation are set to improve on the back of the Philippine Golf Course Management Conference. Organised by the Federation of Golf Clubs Philippines in co-operation with the National Golf Association of the Philippines (NGAP) and supported by the Philippine Sports Commission, the two-day event in Dasmarinas City was presented by the Asian Golf Industry Federation (AGIF). Representing 30 golf clubs across the Philippines, more than 120 golf course superintendents, course maintenance managers, golf directors and club managers were present at The Orchard Golf and Country Club, a Golf Facility Member of the AGIF. Assessing the impact of the gathering, Conrad Benitez, President of The Orchard Golf and Country Club and Vice-President of the NGAP and the Federation of Philippine Golfers, said it was imperative for course superintendents around the country to share their knowledge and experience. Benitez said: “The staging of the conference helps our industry, and ultimately, ourselves. If the industry is healthy and thriving, everyone will benefit. We measure the conference’s success by the ever-increasing number of participants as it gets better attended every year – and by the level of discussions and amount of information sharing that goes on at the seminars. Eric Lynge, the AGIF’s Chief Executive Officer, said: “Our gratitude goes to Conrad Benitez for his continuing staunch support of education for superintendents in general and this event in particular. “It’s encouraging once more to see such a strong turnout from superintendents around the country and is an indication that owners and developers are realising that the quality of the golf course is essential. “Too often in the past, at golf clubs across Asia the importance of course maintenance when preparing annual budgets has been overlooked. It’s the staging of seminars and conferences like this that will hopefully bring about a change in mindset. At The Orchard, seminars took place on the opening day. The following day featured field demonstrations and an equipment exhibition, which was open to members and non-members of the Federation. Over the two days there were a total of 12 presentations covering a variety of topical topics. Among the high-profile presenters were Bruce Williams, International Marketing Manager for Grigg Bros, Quality Golf Executive Director Tony Taylor and Dr Micah Woods, Chief Scientist at the Asian Turfgrass Centre. Other speakers included Bob Horan (Managing Director, Sports Turf Solutions); Antonio Ocampo (General Manager, Valley Golf); Roger Goettsch (Superintendent, Shanqin Bay Golf Club); Mike Singaran (Superintendent, Pradera Golf); James Prusa (Golf Course Management Head at Korea’s Sky 72); Dr Noel Sedigo (Chair, Forestry and Environmental Science, Cavite State University) and Dr Robert Wimmer (Chairman, Independent Research Association GrAT – Centre for Appropriate Technology). There was also a presentation on Golf Course Preparation for Major Tournaments from Mohd Nizam Othman, superintendent at TPC Kuala Lumpur where each year the East Course hosts the Sime Darby LPGA Malaysia event and the West Course stages the US PGA Tour’s CIMB Classic. The club also accommodates an average of 50,000 member rounds annually. Nizam has acquired the highest qualification as a Certified Golf Course Superintendent (CGCS), the first Malaysian to receive the professional certification. Sponsors for the Philippine Golf Course Management Conference were Foley United, Hunter Industries, Indigrow, Jacobsen, Maredo, Quality Golf, Rain Bird, Shibaura, The Andersons and Toro. 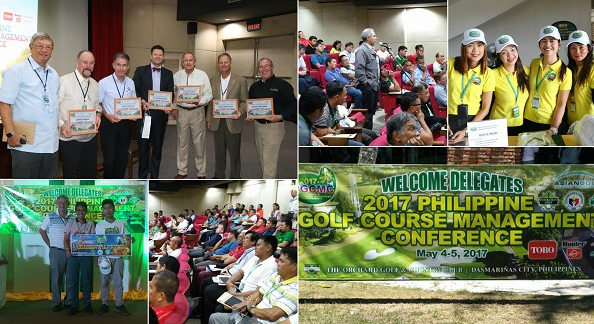 The Philippine Golf Course Management Conference was the fourth event in the AGIF series of Turfgrass Management Seminars and Field Days in 2017. The Vietnam Turfgrass Management Seminar took place at BRG Legend Hill Golf Resort in the last week of April.